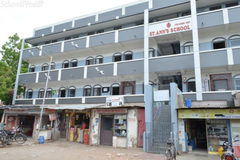 The admission form for Nursery and Pre-Kindergarten are available from the school premises by end of October and the admission process is completed by end of November however admissions into higher grades depends on seat availability.,The Academic Year for the school begins in April each year.\n The admission process into the school is simplistic and requires minimal basic information of any ward seeking admission into the school.\n Parents of students seeking admission into the school are requested to follow the steps as listed below:-\n Prior To Admission:\n i. Collect “Admission Request” form from reception.\n ii. Submit filling in all required details.\n iii. Wait for Interaction Call.\n Interaction Call:\n i. Students and parents of selected candidates will be called to school for an interaction with the school Director and/or Principal.\n ii. Students seeking admission in Grade 4 and above may have to appear for an “admission test” – where questions pertaining to required relevant knowledge will be asked from Languages, Science and Maths.\n iii. 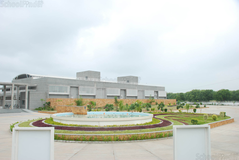 The student score will form an important pre requisite for admission.\n iv. Student may be allowed to tour the school campus and meet faculty with prior permission from the Director’s Office.\n Post Admission:\n i. Collect Admission Form and submit with relevant documents\n ii. Payment of Fees to the Accounts Department.\n No admission is complete until the Transfer Certificate from the last recognized school attended is produced, countersigned by the District Education Officer of the state, if the pupil comes from another state.\n Students can be asked to leave the school in case of indiscipline or if attendance is below 70%. 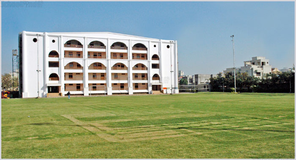 Best schools in Ahmedabad, Best schools in Satellite, Best ICSE schools in Ahmedabad, Best ICSE schools in Satellite, Best IGCSE schools in Ahmedabad, Best IGCSE schools in Satellite, Best Coed schools in Ahmedabad, Best Coed schools in Satellite, Best English medium schools in Ahmedabad, Best English medium schools in Satellite.